When approaching Iran, the Republican Party line and the Hugo Chavez line are running in opposite directions -- but parallel. The leadership of GOP reaction and the leadership of Bolivarian revolution have bought into the convenient delusion that long-suffering Iranian people require assistance from the U.S. government to resist the regime in Tehran. Inside Iran, advocates for reform and human rights have long pleaded for the U.S. government to keep out of Iranian affairs. After the CIA organized the coup that overthrew Iran's democracy in 1953, Washington kept the Shah in power for a quarter century. When I was in Tehran four years ago, during the election that made Mahmoud Ahmadinejad president, what human rights activists most wanted President Bush to do was shut up. The Sept. 25 edition of Time magazine illustrates how the U.S. news media are gearing up for a military attack on Iran. The headline over the cover-story interview with Iran's president, Mahmoud Ahmadinejad, is "A Date With a Dangerous Mind." The big-type subhead calls him "the man whose swagger is stirring fears of war with the U.S.," and the second paragraph concludes: "Though pictures of the Iranian president often show him flashing a peace sign, his actions could well be leading the world closer to war." Ahmadinejad has risen to the top of Washington's -- and American media's -- enemies list. Within the last 20 years, that list has included Manuel Noriega, Saddam Hussein and Slobodan Milosevic, with each subjected to extensive vilification before the Pentagon launched a large-scale military attack. Whenever the president of the United States decides to initiate or intensify a media blitz against a foreign leader, mainstream U.S. news outlets have dependably stepped up the decibels and hysteria. But the administration can also call off the dogs of war by going silent about the evils of some foreign tyrant. When Iran's president, Mahmoud Ahmadinejad, invited President Bush to engage in a "direct television debate" a few days ago, the White House predictably responded by calling the offer "a diversion." But even though this debate will never happen, it's worth contemplating. Both presidents are propaganda junkies -- or, more precisely, propaganda pushers -- so any such debate would overdose the audience with self-righteous arrogance. The two presidents are too much alike. One of the nation's leading pollsters, Andrew Kohut of the Pew Research Center, wrote a few weeks ago that among Americans "there is little potential support for the use of force against Iran." This month the White House has continued to emphasize that it is committed to seeking a diplomatic solution. Yet the U.S. government is very likely to launch a military attack on Iran within the next year. How can that be? In the runup to war, appearances are often deceiving. Official events may seem to be moving in one direction while policymakers are actually headed in another. On their own timetable, White House strategists implement a siege of public opinion that relies on escalating media spin. One administration after another has gone through the motions of staying on a diplomatic track while laying down flagstones on a path to war. How Long Will MoveOn.org Fail to Oppose Bombing Iran? MoveOn.org sent out an email with the subject line Don't Nuke Iran to three million people on April 12. "There is one place where all of us can agree: Americans don't support a pre-emptive nuclear attack on Iran, and Congress must act to prevent the president from launching one before it's too late," the message said. And: "Please take a moment to add your name to our petition to stop a nuclear attack on Iran." The petition's two sentences only convey opposition to a "nuclear" attack on Iran: "Congress and President Bush must rule out attacking Iran with nuclear weapons. Even the threat of a nuclear attack eliminates some of the best options we have for diplomacy, and the consequences could be catastrophic." In MoveOn's mass email letter, the only reference to a non-nuclear attack on Iran came in a solitary sentence without any followup: "Even a conventional attack would likely be a disaster." "Likely" be a disaster? Is there any U.S. military attack on Iran that plausibly would not be a disaster? The current flurry of Western diplomacy will probably turn out to be groundwork for launching missiles at Iran. Air attacks on targets in Iran are very likely. Yet many antiwar Americans seem eager to believe that won't happen. Illusion 1: With the U.S. military bogged down in Iraq, the Pentagon is in no position to take on Iran. The huge gap between Tehran and Washington has widened in recent months. Top officials of Iran and the United States are not even within shouting distance. The styles of rhetoric differ, but the messages in both directions are filled with hostility. While visiting Iran's capital in early summer, during the home stretch of the presidential campaign, I was struck by paradoxes. From all appearances, most Iranians despise the U.S. government but love Americans. Repression, imposed from above, coexists with freedom taken from below. The press is largely dogmatic, but some media outlets show appreciable independence. 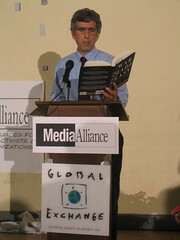 Norman Solomon spoke about “War Made Easy: How Presidents and Pundits Keep Spinning Us to Death" at a benefit for Global Exchange and Media Alliance at the Women's Building in San Francisco. It was shown on C-SPAN 2 on Book TV. Alternet has posted the audio online as an MP3 that can be downloaded or listened to online. There also are more photos. Norman Solomon was on KQED's Forum and the Joy Cardin Show (audio is online for both). War Made Easy was reviewed by David Swanson.